What Do I Do With Leeks? Not to get off topic, but don’t they look amazingly appetizing? The long, slender, sleek look is in, right? And their attractive blue-green and white contrast and palm-like fans at the top make leeks unarguably one of the most gorgeous specimens of the vegetable world. 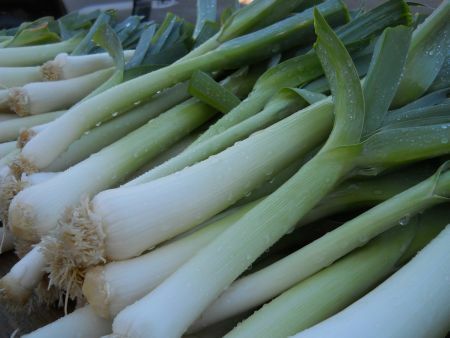 Read more about What Do I Do With Leeks? Thanksgiving is just around the corner... And eating healthy while having fun and relaxing with family is on my mind. And yours too, I bet! Enter to win our farm fresh Thanksgiving Veggie Basket PLUS 6 recipes to go with it and you’ll be well on your way to simple, easy holiday eating that includes farm fresh organic vegetables! What is the official giveaway prize? Ever get overloaded with veggies in your fridge? But not looking to do a whole lotta cooking? Maybe you’re a CSA member who has gotten a little behind or have a large garden or just over bought at the grocery store. This happens to me often! And I just love the feeling of cleaning out the fridge. It’s kinda like the feeling of checking off your entire to-do list! It’s only just November and doesn’t it feel like winter already? Eeek! What with temps down to 20 last week, howling wind-chills, and two snowstorms to add insult to injury, I’m ready for some bonafide warming comfort food! How about you? And a bowl of hot soup hits the spot, right? Definitely for me! And, to be honest, I would like to have a soup pretty much every day of the fall and winter if I had my act together to do it. Because they taste soooo good! Read more about What to do with all that squash! Said a participant of my recent class on fermenting vegetables. And I totally understand how she felt! Have you ever said that about new things in general? I know that I certainly have! Sometimes just the thought of doing a new thing can completely overwhelm me. I become convinced that it must be hard and complicated to do, even if it turns out to be really easy to do! Soup is one of the things I serve that I get the most complements on. Why? It’s kind of like building a house. It needs to start with a solid foundation or else it won’t be very successful. Soup is the same way. And broth is that foundation. Broth is a magical ingredient in soup that you can’t see, but makes it taste so much better. By eating vegetables for breakfast! Okay, okay, I understand that the idea may be weird to you. Well, it was weird to me, too, about 13 years ago. But here we are today, and we eat vegetables for breakfast all the time and love it! In fact, when we don’t, I seriously miss it! Veg for breakfast? How on earth did you think of that??? Were you raised that way? And even more humorously she invariably answers her own question with something not-so-seasonal-anymore like “probably sixty-six”. Are you looking for creative ways to eat more veggies? Maybe you’ve roasted veggies before? Yeah, yeah of course you have. Boring topic. Now, that’s where you’re wrong, young lady. Oh wait, that’s what my mom used to say to me when I was a kid. But seriously roasting veggies is like magic for so many reasons! And every year when fall rolls around I rediscover my love for roasted veggies.